It doesn’t get any simpler–or more delicious–than this. 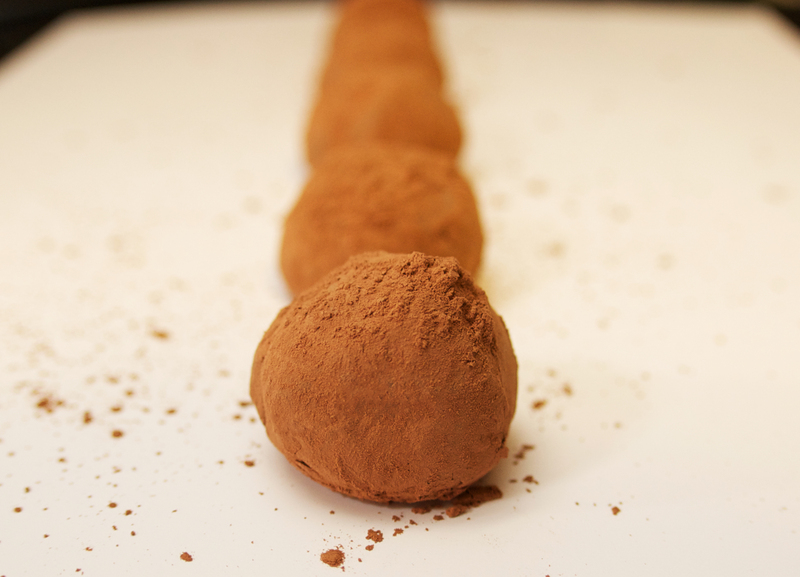 Dark chocolate, Nutella and hot red pepper come together to form divine, melt-in-your-mouth dark chocolate truffles. For best results, use good-quality dark chocolate. In a bowl, place all the Nutella, broken up dark chocolate bar, honey, butter and ground red pepper. 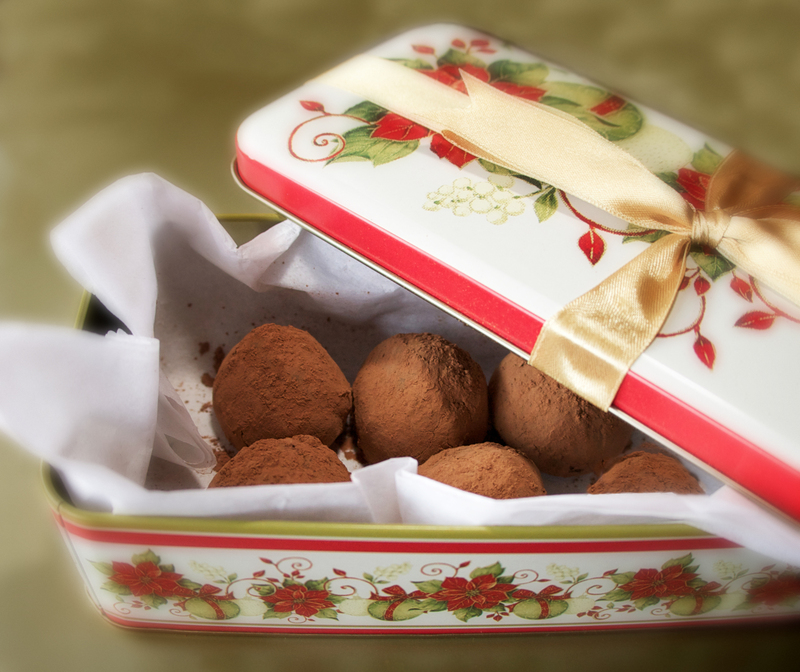 In a microwave, heat the mixture about 1 minute 30 seconds on high or until the chocolate melts. Remove the bowl from the microwave and with a spoon, stir the mixture vigorously until smooth. As the mixture begins to cool, it will come away from the bowl easily like a soft dough. Cover the bowl with plastic wrap and chill for at least an hour or until the mixture is firm enough. Using a small spoon, scoop out a walnut-sized ball of ganache from the bowl. The texture of the ganache should be firm enough to scoop, but still a bit soft and not entirely hard. It should form a ball in the bowl of the spoon fairly easily and not crumble or break apart. Drop the ball of ganache into the mound of cocoa powder and stir it around so it is covered with cocoa powder. Don’t worry about the shape right now and DON’T touch it with your hands as of yet. Now that the ganache balls are roughly formed, it’s time to make them round. 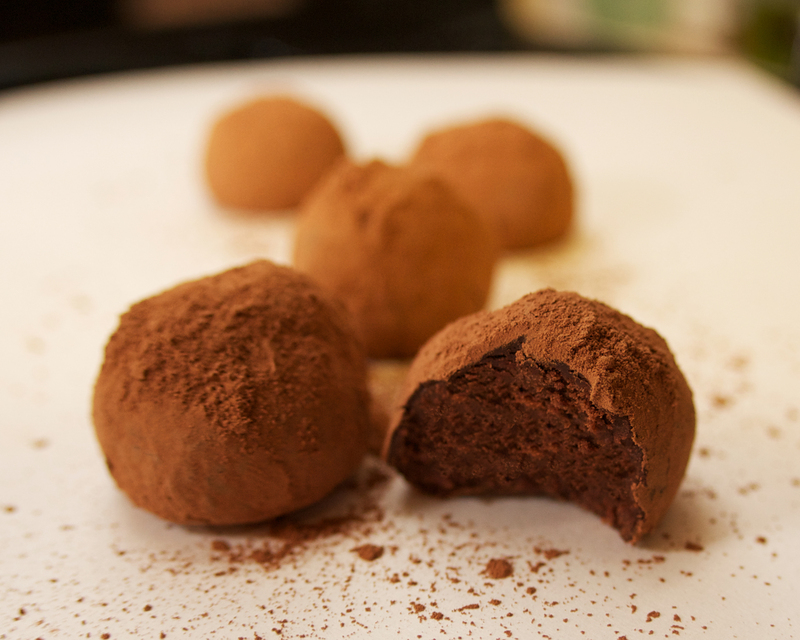 Dust your hands with cocoa powder and pick up a cocoa-covered ganache ball. Gently roll it between your palms until it is round and coat it with cocoa powder, then place it on a foil-lined baking sheet. Because the ball is already covered with cocoa powder and is fairly firm, it should be easy to shape and not stick to your palms very much. Repeat with remaining ganache and cocoa powder. If at any time the ganache becomes too soft to work with, place it in the refrigerator to chill for a few minutes. This entry was posted in Uncategorized and tagged Nutella, spicy, truffles. Bookmark the permalink. OK Mammalatte, about how many does it make? Can the recipe be doubled or better not to? Not that I can eat the hot pepper but I know quite a few people who can and will!! Sounds super easy & super delish! It makes about 25 walnut sized truffles Nancy. I suppose you can double the batch, you’ll just have to leave it in the refrigerator longer I suppose. The hot pepper is a great little surprise when you bit into it. The amount of pepper is perfect IMO. OMG Chocolate heaven. I will have to try these. You have topped yourself with this one. The pound cake was amazing. I can not wait to try this one! OK I have to try this. I have all the stuff in the house. This week end ! !